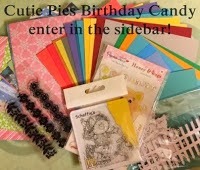 There are some exciting things happening over on the Cutie Pie Challenge Blog. Not only do we have some Followers Candy up for grabs for all our wonderful 700 followers, (woo hoo), which includes a paper bundle and stamp but we also have some Birthday Candy on offer too to help us celebrate our 2nd Birthday, which includes a Paper Bundle, Card Stock Bundle, Stamps, Die Cuts and Cute Digi Stamp from Pollycraft! Anyway, today, to coincide with all these wonderful goings on, we launch a brand new Cutie Pie challenge and our theme this fortnight is Cute Birthday Sketch. The sketch was devised by our lovely Lisa and we are lucky to have two fantastic sponsors. Our first generous sponsor is the Fabtabulous etsy shop FLAT FRIENDS BOUTIQUE who have a fantastic selection of Digis on sale over at their ETSY Store. One lucky winner will win 4 digi stamps, so if you can't wait, then why not pop over and see if there's something that inspires you!?! Our second sponsor is the wonderful JUST SOME LINES Etsy Store and one lucky winner will win a $12 gift certificate! So get out your cute images and get creating! If you’re stuck for ideas pop over to the Cutie Pies blog to see the amazing inspirational designs by my team mates. So what did I create? Well I chose to use a Flat Friends digi called ‘Birthday Wishes’ and I coloured her with Pro/Flexmarkers, 3Ding the cake for a bit of definition. The papers are the uber lush First Edition Dreamcatcher (purpley and sparkly, what’s not to love?). Both the image and the sentiment are cut using Sizzix Framelits dies and the flower is made using Heartfelt Creations’ Sun Kissed Fleur die which I embossed and inked. Some flat backed pearls and a liberal sprinkling of Frantage later and we’re all done. Wonder if she’s gong to be offering that cake around? Smiling always (cake always makes me smile)! Fabulous card Jane - love the flower. Thanks for playing our Bingo Challenge at 4 Crafty Chicks, lovely job! Great card. Love that layout. Thanks for taking part at I ♥ Promarkers this week. Fab card Jane, great papers (got them!) and wonderful colouring on the image.